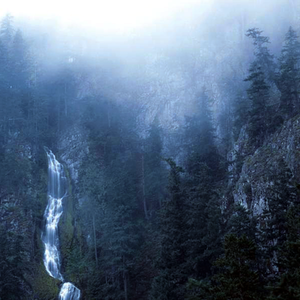 Wolves In The Throne Room – Diadem Of 12 Stars | NoCoda. What It Sounds Like: Black metal is the easy genre to state, but it’s so so far from what you’re thinking, don’t let that term scare you away if you’re not a metal fan. These are not dudes in black hoods with 666’s on their foreheads. It’s heavy, and there are screams (it IS metal), but it’s not an assault on the ears. Heavy doses of ambiance and the singing of the sirens are included to make this a great experience. Diadem Of 12 Stars. It’s from another universe. No doubt about it. See that cover artwork? Imagine you were lost in that vast wilderness setting, most likely in a cold, desolate region of Scandinavia. Lose yourself in that image – put yourself there, and make yourself stay there for a long long while. You start hearing voices. You’re trying to keep your sanity together. Imagine more than anything else in the entire world, that you were desperate to find your way back to the ones (or one) you love, back to those who gave your life meaning, if even just for a second before you left this world forever. This is the start of your journey. This is your soundtrack to keep your mind stable and press on through the unforgiving terrain, even though you don’t know the outcome. This is Wolves In The Throne Room, and you know they’re watching – ready to pounce and overtake you at the slightest misstep. It’s essential to start at the beginning of their discography, though if that was not the case, I would review my favorite record first (2007’s wondrous Two Hunters). But while Wolves In The Throne Room claim there is no interlining narrative between their records, I can’t help but suggest listening to them in order. There’s something mystical about this band. It’s about the fact that the band is essentially two brothers, Nathan and Aaron Weaver, and they tour with various other musicians when they are out on the road, which is rare. It’s the fact that these guys live on a farm on the outskirts of Olympia, Washington, and they grow organic vegetables. It’s that they want their music to somehow bring people back to the “natural world” (take that however you see fit) and how they fight not to get completely consumed in all the technology and latest-breaking fads. These guys arn’t trying to be cool, I assure you. I’m sure I try to be cooler and hip than these guys. They seem genuine all the way though, and it speaks volumes. Diadem Of 12 Stars is a journey. 12:59 being the shortest, and 20:23 being the longest. This isn’t just four songs – it’s an experience. If you’re going to listen to track one, Queen Of The Borrowed Light, you better be willing to commit and follow her where she takes you, through a weaving path of horrible beasts and piercing angels into the darkest, scarcely (borrowed) moonlit night, to eventually find yourself, face to face with a Face In A Night Time Mirror (Parts 1 and 2). There’s plenty of heaviness, so it’s not for the faint of heart, but there is so much ambiance and beautiful expressions mixed in throughout that you can’t help but feel rewarded when the various stanzas come and go. Growls turn into melody. Crushing black hole guitars give way to starlit nights. We make our way to the grand finale of (A Shimmering Radiance) Diadem of 12 Stars, and it feels a final battle, one that will be won or lost in life or death, but a final rest of some sort at that, once and for all. It’s not for an everyday listen; you’re not going to always crave this. I certainly don’t. But when the moment fits the music, and the 12 stars align, you’re transported right back into that Scandinavian wildnerness to face yourself once more. If you had to listen to two tracks: You’d only be halfway through your journey. If you attempt this, the whole record, straight through, is essential.